Meet Jennifer! 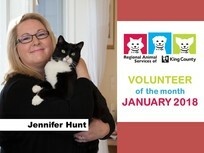 Jennifer Hunt serves as an outstanding Co-Lead of our Kirkland Team of 120 regularly scheduled volunteers. She works "hand in glove" with Co-Lead Teresa Rosenberg and Lead Lucy Camelia. Their inspired teamwork in managing such a large team is key to our success. Jennifer's cheerfulness, skillful attention to detail, and willingness to go the "extra mile" is deeply appreciated. She also works on one of the busiest weekly shifts at the store with wonderful diplomacy and terrific aplomb. Jennifer has helped to lead many sessions of new volunteer orientation. An interview with Jennifer can be found on our website and blog. Thank you, Jennifer! King County Executive Dow Constantine pays tribute to the talent, creativity and hard work of county staff and volunteers for delivering even more effective services, identifying new solutions, and building more welcoming communities for all of the county's residents. With King County's workforce consisting of over 14,000 employees and thousands of volunteers, there were many remarkable achievements last year. We are proud that Dow chose to include RASKC's work as one of King County's top 17 accomplishments in 2017. RASKC looks forward this year to our role in a new animal-welfare initiative named Pet Alliance of Washington (PAW). Supported by the Best Friends Animal Society, this initiative aims to help the entire state of Washington achieve a "save rate" of 90% by the year 2020. Accomplishing this goal will involve RASKC assisting other shelters and rescues with needs such as transport for adoption, facilitating feral cat management, and addressing access to spay and neuter services. Last weekend, for example, RASKC received 25 cats from a shelter in Colville. With a "save rate" of 90%, RASKC is excited for this opportunity to share our experiences with other organizations and help save more animals throughout the state. To help encourage adopters to bring home one or more of RASKC's sweet pit-bull terriers, the adoption fees for this breed will be waived in February as part of our "Love a Pit Bull Month." The only cost will be $30 for the pet license. Several of the same "pitties" resided at RASKC for many months recently. While these dogs won the hearts of staff and volunteer Dog Walkers, we want to make super special efforts to help them be welcomed into loving homes on a furr-ever basis. RASKC/ Kent is open to the public for adoptions every afternoon except on major holidays. Weekday hours: 12pm- 6pm. Weekend hours: 12pm- 5pm. RASKC/ Kent is located at 21615- 64th Ave S.. We are closed to the public on Presidents' Day, February 19. View our adoptable animals online. RASKC encourages interested adults to apply to become a Vet Clinic volunteer. We will soon be making selections to fill nine positions based in Kent. 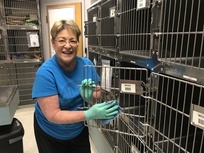 If you are an adult who has attended new volunteer orientation and if you are interested in a weekly shift, please submit a Vet Clinic volunteer application. Vet Clinic Lead Volunteer Linda Sutherland and RASKC staff will begin reviewing applications this month. We seek volunteers who learn quickly, who respond well to directions from staff, and who are comfortable working autonomously. Candidates who are best suited for this job enjoy and are good at cleaning and logistical work. The available shifts include: Monday afternoons; Tuesday mornings and afternoons; Thursday mornings and afternoons; Friday mornings; Saturday afternoons; and Sunday mornings and afternoons. Shifts last three hours. Morning shifts typically start between 8am-9am. Afternoon shifts usually begin between 2pm-3 pm. New enrichment for dogs at RASKC: Ready, Set, Go! If you’ve been inside our Dog Team volunteer room over the past few weeks, you may have noticed the room recently received a big makeover! The refreshed space will now provide everything needed for both dog walks and extra enrichment items to provide more mental stimulation for the dogs. 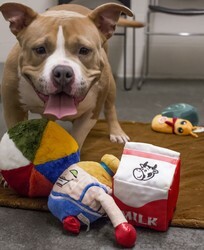 All dog walkers and shelter helpers are encouraged to help create enrichment items for the dogs in their spare time. Please note that we are in the pilot stage for this new project, so we are looking for your ideas for improvements. If you have any questions or suggestions related to the dog enrichment program, please contact Animal Services Coordinator Nickie Ford. Did you know? 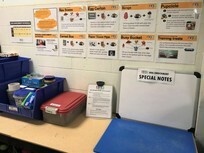 Enrichment programs are a great way to decrease stress and illness and increase behavioral health, which can ultimately lead to an increase in adoptions. A new cat enrichment program will soon be coming to RASKC. 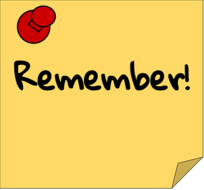 You may read all previous editions of RASKC's Volunteer eNews online. Tim is responsible for the animal control, shelter and off-site programs at RASKC, including animal care and adoptions; staffing of Animal Care Technicians, Animal Control Officers, and sergeants; investigations; facilities maintenance; training; and cultivating working relationships with law enforcement, city partners, and many other organizations. Tell us about yourself. My wife and I have five kids. My oldest son just graduated from Western Washington University and lives in Bellingham. We have four daughters who live at home (ages 7, 12, 13 and 14). They keep me busy with school activities and sports. We have a dog named Avery, who helps to keep everyone in line. Why did you decide to work to help animals? Like everyone at RASKC, I love animals. In my position I get to help animals that are being neglected or mistreated. I also get to help these and many other animals find forever homes. What did you do prior to coming to RASKC? 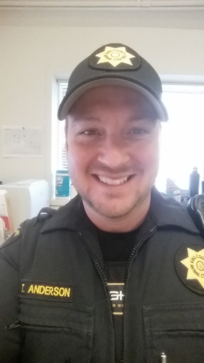 I worked for the Pierce County Sheriff’s Department as their Animal Control Supervisor. I started my career as an Animal Control Officer in Kitsap County and had brief stints working at the Coroner’s Office and even selling pet food and supplies to retailers throughout the west. What does your work for RASKC involve? Answering lots of questions. I spend a great deal of time talking with staff, King County residents, and members of other agencies. I turn challenges in to opportunities. What is the best part about your job? The best part of my job is getting to work with all the great staff, volunteers, residents, and partners. We do some really cool work and I’m proud of our success. What do you do when you’re not at work? My four daughters keep me busy. They are involved in soccer, football, and softball. We enjoy being outdoors as much as possible and doing things as a family. I can also be found working as a reserve police officer, which I’ve done for more than 20 years. Please share a story about an experience with great volunteers. I get the opportunity to work with so many great volunteers. Over the years I’ve had the chance to work with many Meet and Greet volunteers, Dog Walkers and volunteers at off-site locations and events. I am continually impressed by all of the work the volunteers do. From the Shelter Helpers who come in and wash dishes and do laundry and not get paid for it, then go home and do their own laundry and dishes; to the Dog Walkers who get the dogs out for walks every day no matter the weather; the volunteers who adopt out so many cats off site and those who help out at events sharing with the public all of the good we do here at RASKC. You are all providing an incredible service to the animals, staff and community! Johnny is a three year old brindle Pit Bull (ID #A543939). He is a very smart boy who already knows how to sit. Johnny is full of energy and loves to play! He tends to calm down more when people around him stay calm. Johnny also does his best when he has lots of exercise and something to keep his mind busy. He will need to be in experienced hands to help him be the best dog he can be. 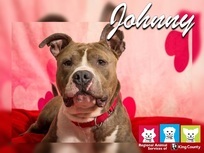 Johnny is working on his manners, so would do best with a family who is willing to work with him. Johnny may do best as the only dog in his new home. His personality color is red. Johnny is neutered, current on vaccinations and microchipped. His $100.00 adoption fee also includes 30 days of free pet insurance through Trupanion if activated. 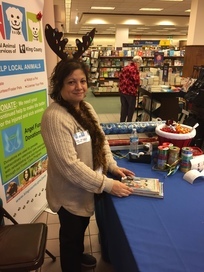 Volunteers raised over $1,270 for our Angel Fund from the Barnes and Noble holiday gift-wrapping fundraiser last month. Thanks to the remarkable efforts of about 50 volunteers, especially Lead Volunteer Jini Allen! Warm 106.9 presented a live Facebook broadcast from RASKC last month. We also appreciate the work of this radio station to promote "Wet Nose Wednesdays" featuring animals at a variety of our community partners including Seattle Humane, PAWS, and Auburn Valley Humane. Attend an animal-welfare conference this year. If you would like to learn more about the fascinating world of animal sheltering, consider attending one of these conferences- California Animal Care Conference (March 11-13, Long Beach); Humane Society of the United States Pet Expo (May 14-18, Kansas City); or Best Friends Animal Society (July 19-21, Los Angeles). If you or your pet have ringworm symptoms, then it's very important that you are absent from RASKC. It's one of the few diseases that transmit between animal and humans. Check online to see what ringworm symptoms look like. You may resume volunteering after your symptoms disappear. If your pet might have ringworm, then you can come back only after your pet is cleared by a veterinarian. Dog kongs: Size matters. Be sure the size of the kong is appropriate for the dog. For example, if bigger dogs are accidentally given kongs too small, this can place the dogs at risk of choking. It's important that only Dog Walkers and staff give out the kongs. Are you a veteran? If so, thank you for your service. Please let us know by clicking on the veteran box in the optional demographics section in the "My Profile" tab in your online record. If you're not sure how to do this contact RASKC. Thanks! Note: If you have not yet attended new volunteer orientation, please do not contact any of the Team Leads. The positions listed below are to be filled by people who have already attended the session and have already submitted the required paperwork. Thanks. Vet Clinic Volunteers @ RASKC/ Kent (adults only) Complete a Vet Clinic application. Morning shifts are three hours during 8am- 1pm. Afternoon shifts are three hours during 2pm- 6pm. RASKC seeks volunteers who will likely be assessed "red"- already skilled enough to handle our more challenging dogs. RASKC has 180 volunteers in our database interested in walking dogs, and more are welcome. RASKC has the capacity usually to train four new Dog Walkers each month, though we are welcoming eight trainees in January. Starting this month and on a monthly basis, RASKC is giving "green" and "blue" Dog Walkers an opportunity to be re-assessed to "red." While RASKC will be closed to the general public on Presidents' Day, February 19, our animal-care work continues. Cat Meet and Greet @ RASKC/ Kent: No shifts. Dog Walkers @ RASKC/ Kent only until 4pm. Shelter Helpers @ RASKC/ Kent only until 4pm. Several online articles describe the pets that George Washington and Abraham Lincoln loved. Apparently Washington had many hound dogs, a dalmatian named Madame Moose, and a parrot. Lincoln loved cats Tabby and Dixie and could play with them for hours. When asked if her spouse had a hobby, Mary Todd Lincoln replied, "cats." 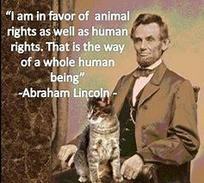 Lincoln also cared for dogs Fido and Jip. His children delighted in many pets at the White House, including goats Nanny and Nanko.